The Mekong Delta province of Soc Trang should make strong economic structure shifting for achieving major breakthroughs in the socio-economic development in 2019, said Prime Minister Nguyen Xuan Phuc. Ho Chi Minh City’s economy remained on the growth in the first quarter of this year, said Chairman of the Municipal People’s Committee Nguyen Thanh Phong at a review meeting in early April. 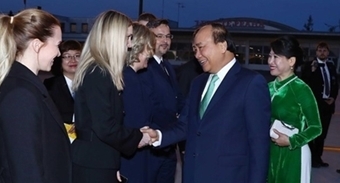 Prime Minister Nguyen Xuan Phuc attended a ceremony in the Mekong Delta city of Can Tho on April 6 to launch five domestic air routes by the low-cost carrier Vietjet Air. Public private partnership and proposals by the private sector would be key topics of discussion at the upcoming Vietnam Private Economic Forum scheduled for May 2 and 3 in Hanoi. The Vietnam Textile and Apparel Association (Vinatex) has reported that total export earnings of the garment and textile sector in the first quarter reached nearly 8.7 billion USD, up 11.31 percent over the same period last year. The Vietnam-Russia joint venture Vietsovpetro reported that its oil and gas production in the first quarter of 2019 surpassed its target for the period. Vietnamese Minister of Finance Dinh Tien Dung met with his Thai counterpart Apisak Tantivorawong on April 4, discussing priorities in finance issues in ASEAN in 2019 and 2020. The domestic cement industry is striving to reduce at least a tenth of the country’s energy drain in ­accordance with the country’s national programme on economical and efficient use of energy for the 2019-2030 period, but there remains a number of obstacles to overcome. Vietnam’s leading clean energy event, The Solar Show 2019, is being held in Ho Chi Minh City from April 3-4, attracting thousands of exhibitors and experts from countries and territories worldwide. Three made-in-Vietnam rail mounted quayside cranes (RMQCs) are headed to India. The State Treasury of Vietnam mobilised more than 14.2 trillion VND (612.56 million USD) via 16 Government bond (G-bond) auctions on the Hanoi Stock Exchange (HNX) in March. The Hanoi People’s Committee has issued a plan to improve the municipal business climate and competitiveness index (PCI) this year. Deputy Prime Minister Trinh Dinh Dung has urged the fisheries sector to build a safe and high-quality seafood brand, continue increasing the quality of products, maintain traditional markets and develop new ones. More than 100 organisations and businesses of Vietnam, China, Laos and Thailand have joined the International Trade Fair of the Northwest Region 2019 that was opened in Dien Bien Phu city in the northwestern province of Dien Bien on March 30. The U.S.’s Universal Alloy Corporation began construction of its $170 million Sunshine aerospace components factory in Da Nang Friday. The European Union’s technical assistance project, started from February 2019, will help Vietnam strengthen competitiveness of its destinations and gain a better position in the changing international tourism market, according to the Vietnam Tourism Advisory Board (TAB).